4Videosoft Mac iPhone Video Converter 5.0.28 無料ダウンロード - Convert all videos to iPhone MP4/H.264 on Mac, convert/extract audio to MP3/M4A. 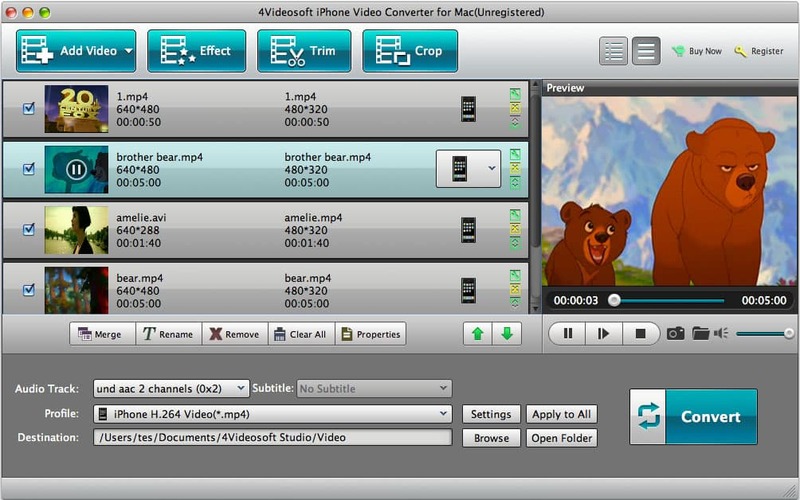 4Videosoft iPhone Video Converter for Mac is an excellent Mac iPhone Video Converter which can be used freely to convert MPG, MPEG, MPEG2, MTS, M2TS, TS, VOB, MP4, M4V, RM, RMVB, WMV, ASF, etc. to iPhone video MP4, H.264/MPEG-4 AVC(.mp4), MOV for you to enjoy on iPhone. This Mac iPhone Movie Converter now newly supports iOS 6 and iPhone 5, and the function of contacts has been added to it. As a powerful Mac iPhone Video Converter, 4Videosoft iPhone Video Converter for Mac is possessed of strong editing functions such as adjusting output video effect, capturing any clips, cropping video play region, attaching watermark for your video and joining files into one. 4Videosoft iPhone Video Converter for Mac offers you an easy way to convert all mainstream videos and HD videos to iPhone MP4, H.264 video with high quality. You are also allowed to extract audio from video and convert to MP3, M4A audio formats. This 4Videosoft iPhone Video Converter for Mac enables you to adjust video Contrast, Brightness, Saturation and Volume to get the perfect visual effect. The additional Deinterlacing function can help you to avoid mosaic to get the progressive video. You are able to cut off the black edges and adjust the aspect ratio to make the video exactly fit your player. You can get any part of your source video and merge several separated files into one file for you to enjoy. This converter allows you to input one or more files. At the same time, you can set several different output file formats for each so as to save time. It is convinient for you to adjust Video Encoder, Resolution, Frame Rate, Video Bitrate, Audio Encoder, Sample Rate, Channels and Audio Bitrate. You can also input your own one if the provided can not meet your needs. Then the well-customized settings can be saved as User-Defined profile for your later use.